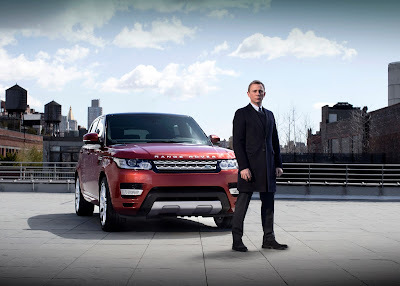 British based automaker Land Rover has unveiled its new 2014 Range Rover Sport at a media event in New York. Daniel Craig, aka James Bond, was paid $1 million (!) to drive the car into the unveiling. After skilfully handling the car and driving it through closed off streets, Craig delivered the all-new Range Rover Sport to a packed crowd of guests including Michael Strahan (former American football player and TV Presenter), Yasmin Le Bon (Model) and Jade Jagger (Designer) at Skylight at Moynihan Stationon 8thAvenue where the vehicle was officially revealed for the first time. Craig was attracted to working with Land Rover not only because of his love for the British brand and its vehicles - but also because both he and the brand share a link with the charity S.A.F.E., of which he is a patron. On sale during the third quarter of 2013, the new Range Rover Sport will ultimately be introduced in 169 markets worldwide.